Stacie Bloomfield's personalized animal illustrations blend winsome personality & great graphic design. Inspired by the sophisticated graphics of midcentury children's books and the colors and patterns of vintage quilts, Stacie Bloomfield's animal illustrations blend winsome personality with impeccable color and design. Her personalized portraits, with their clean lines and confident use of negative space, are sweet enough for children, but smart enough for adults. 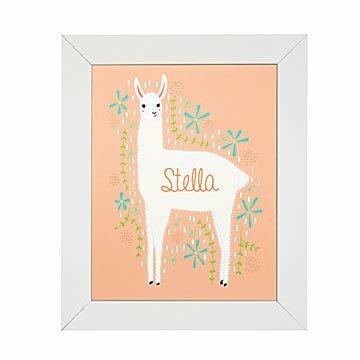 Your child's name will appear in stylized white letters on the animal of your choice: a floating swan or otter, a garden-raiding rabbit, a beehive-robbing bear, a napping fox, a deer hiding in the flowers, a llama looking right at you, or a sloth hanging out on a tree branch. Is it possible for nursery art to be simultaneously cute and elegant? Here's the proof. Stacy Bloomfield’s love of graphic and interior design began early: for her eighth birthday, she asked for a subscription to Martha Stewart Living magazine. After getting an art degree in college, she became pregnant with her first child. Scouring magazines for nursery decor inspiration, she didn't love anything she saw. Her husband handed her a marker and said, "Stacie, draw your own nursery art!" She began creating art that was sweet enough for kids, but smart enough for adults. Much of her inspiration comes from animals, so Stacie has donated a portion of her sales to the Humane Society since 2013. This one was verynice and name was spelled correctly-- unlike her brother's .which was not and had to be re=ordered. This is a wall hanging in the baby's room but convinced it will be there for years. It is gorgeous. I purchased 3 of these, each representing one of our beloved pets. The rabbit to represent our cat who has the softest bunny feet. The fox to represent our dog who is the same color and always sleeps in what we affectionately call the circle position. And the otter, for our other dog who always sleeps belly up and feet flapping.